Congratulations! Your site has been nominated AND chosen to win the "Golden Disk" Award! This is NOT given to everyone, consider your Web Site something special!! Keep up the excellent work on your web-site, we really did enjoy our visit!! 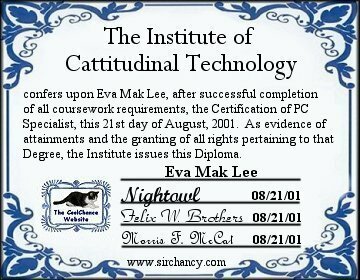 We are proud to present you with the Institute of Cattitudinal Technology Diploma, so earned for successful completion of all coursework requirements! We are including your personal Cattitudinal ID Card. Our best wishes to you! This award is presented us by Maria and Xinxin for Website Excellence.